Parameter maps based on wavelet-transform post-processing of dynamic perfusion data offer an innovative way of visualizing blood vessels in a fully automated, user-independent way. The aims of this study were (i) a proof of concept regarding wavelet-based analysis of dynamic susceptibility contrast (DSC) MRI data and (ii) to demonstrate advantages of wavelet-based measures compared to standard cerebral blood volume (CBV) maps in patients with the initial diagnosis of glioblastoma (GBM). Consecutive 3-T DSC MRI datasets of 46 subjects with GBM (mean age 63.0 ± 13.1 years, 28 m) were retrospectively included in this feasibility study. Vessel-specific wavelet magnetic resonance perfusion (wavelet-MRP) maps were calculated using the wavelet transform (Paul wavelet, order 1) of each voxel time course. Five different aspects of image quality and tumor delineation were each qualitatively rated on a 5-point Likert scale. Quantitative analysis included image contrast and contrast-to-noise ratio. Vessel-specific wavelet-MRP maps could be calculated within a mean time of 2:27 min. Wavelet-MRP achieved higher scores compared to CBV in all qualitative ratings: tumor depiction (4.02 vs. 2.33), contrast enhancement (3.93 vs. 2.23), central necrosis (3.86 vs. 2.40), morphologic correlation (3.87 vs. 2.24), and overall impression (4.00 vs. 2.41); all p < .001. Quantitative image analysis showed a better image contrast and higher contrast-to-noise ratios for wavelet-MRP compared to conventional perfusion maps (all p < .001). wavelet-MRP is a fast and fully automated post-processing technique that yields reproducible perfusion maps with a clearer vascular depiction of GBM compared to standard CBV maps. 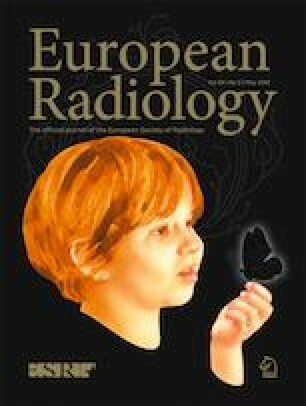 • Wavelet-MRP offers high-contrast perfusion maps with a clear delineation of focal perfusion alterations. • Both image contrast and visual image quality were beneficial for wavelet-MRP compared to standard perfusion maps like CBV. • Wavelet-MRP can be automatically calculated from existing dynamic susceptibility contrast (DSC) perfusion data. The online version of this article ( https://doi.org/10.1007/s00330-018-5892-2) contains supplementary material, which is available to authorized users. The authors state that this work has not received any specific funding. The scientific guarantor of this publication is Dr. Thomas Huber. The authors of this manuscript declare relationships with the following companies: TH and LR consultancy for Smart Reporting GmbH (Munich, Germany); BW speaker honoraria from Bayer; TH, JG and SB consultancy for Brainlab AG (Feldkirchen, Germany); JSK research support by DFG, ERC, Acandis—travel support by Kaneka Europe—speaker honoraria by Philips; WHS founder and CEO of Smart Reporting GmbH (Munich, Germany) and founder of Planerio GmbH (Munich, Germany); JR research grant Sirtex Medical Ltd. and research grant Bayer AG; CZ has served on scientific advisory boards for Philips and Bayer Schering; serves as co-editor on the Advisory Board of Clinical Neuroradiology; has received speaker honoraria from Bayer-Schering and Philips and has received research support and investigator fees for clinical studies from Biogen Idec, Quintiles, M.S.D. Sharp & Dome, Boehringer Ingelheim, Inventive Health Clinical U.K. Ltd., Advance Cor, Brainsgate, Pfizer, BayerSchering, Novartis, Roche, Servier, Penumbra, W.C.T. GmbH, Syngis, S.S.S. International Clinical Research, P.P.D. Germany GmbH, Worldwide Clinical Trials Ltd., Phenox, Covidien, Actelion, Medivation, Medtronic, Harrison Clinical Research, Concentric, Penumbra, Pharmtrace, Reverse Medical Corp., Premier Research Germany Ltd., Surpass Medical Ltd., and GlaxoSmithKline. All listed conflicts of interest are unrelated to the present study. Written informed consent was waived by the Institutional Review Board.